The hope of the River since day one was that we would be a vital part of our city. That we would be a culture within our culture that loves Jesus, believes scripture, and lives for the good of the whole city and not just our own self interests. Our heart was really to build a culture within our culture that would love our town, and seek to transform our town as they meet Jesus. And right now, in the middle of a disaster, we've been given an "opportunity" to further that vision and in a powerful way LOVE OUR CITY! Nehemiah had a similar situation. He could have thought, "I'm glad I don't have to deal with the trouble in Jerusalem." He was far away and could have ignored it. He could have gotten angry at them, considering them to be lazy or stupid (you know, kind of like you feel about our "leaders" in Washington?). But he prayed for his people, he prayed for his town with grief. And humility! One of the most surprising words you find in his prayer is the word, "we." "I confess that we have sinned against You" (see Nehemiah chapter 1). Even though he was far away, serving in the luxury of the court of the king of Persia, Nehemiah knew he was part of "we." "We" are all in this together. He prayed about "we." He confessed about "we." He grieved for "we." And then he asked God and the king to be allowed to go, with money and supplies to help "we." We at the River are "we" of Lyons. No "them and us" here; We are "we." There is a certain amount of adrenalin that carries you through in times of evacuations in the middle of the night, even a certain amount of a spirit of adventure that, at first, allows us to be brave and optimistic. 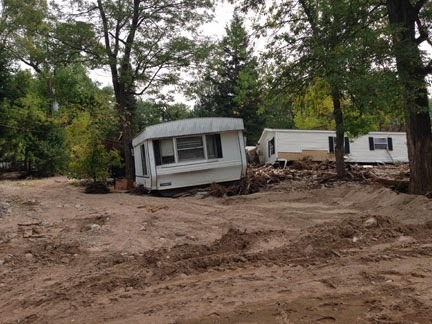 But now people are returning to Lyons – not to live, not yet – but to shovel the muck, search for precious things, and to deal, face to face for the first time, with the enormity of what has just happened. It is overwhelming. The expressions you see around town look stricken, stunned and hopeless. Some have simply moved away; it's just too much. But God has chosen to put us, The River, right here in our little town. By His sovereignty, He has allowed us to suffer the same kind of devastating set-backs as have our neighbors. Now, as people are returning, we will be His hands and feet, His servants and witnesses. But how? How can a tiny congregation do much of anything in the midst of such confusion and loss? Nehemiah has some great insight on how to answer those questions. When Nehemiah was faced with overwhelming circumstances, the first thing he did was to avoid the great temptation to look away. Instead he opened his eyes and his heart, indentifying with his neighbors in their time of loss. And he wept for them – no, that's not right; he wept with them. And then he called Somebody he knew. He fasted and prayed. 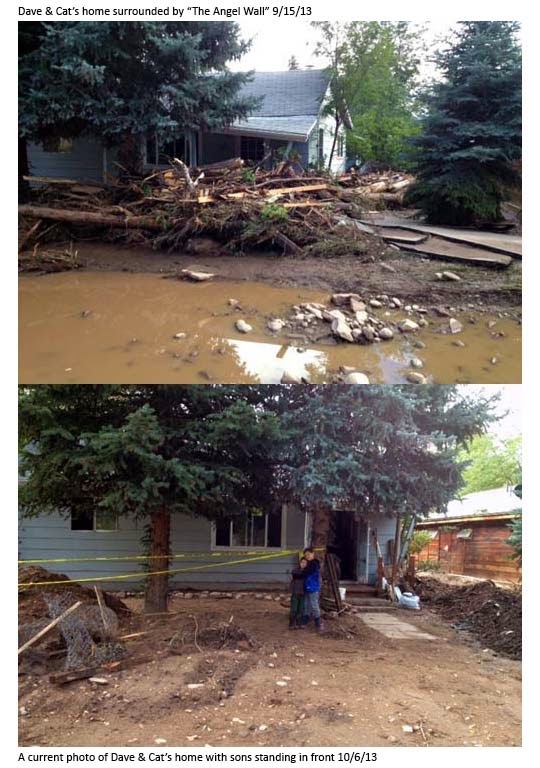 How will a tiny congregation that God planted in Lyons respond to such destruction and despair? Let's start with heartfelt compassion – sharing the grief of those who have lost so much. And then let's pray – fast and pray as God leads you. As God leads us. And then lets watch and listen as God leads us to be His hands and feet to our community. The adrenalin, and adventure will fade, but God will never leave us or abandon us! 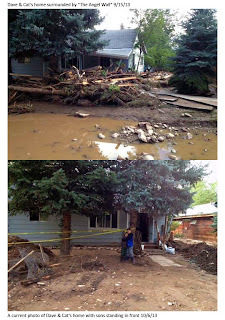 Last Thursday, a church in Aurora, Colorado, called down to a church disaster ministry in Louisiana, asking if they could send help to Colorado. How does that work? Jesus did it. He arranged for the disaster ministry, called ReachGlobal, to personally contact several churches in the flood zone - including us at the River - to see what help they could offer. For five years, the church in Aurora had been sending work teams down to help after Katrina, working with ReachGlobal, because they had been sent there by Jesus. The next time they called, Jesus said, "Send them to Colorado." ReachGlobal called The River. The only way for us to receive a work team last weekend was to work with LifeBridge church. Why? Jesus had told them to devote the energies of His large church there to organizing relief work. They had gotten so well organized that they were able to convince the City of Lyons it would be safe to send work teams. (Once you see the condition that Lyons is in, you will understand why the City leaders are being so cautious...) How did LifeBridge get so well organized? They were trained by a team of experts from back east, a group that does this kind of training after disasters all over the country. Why? Let's see if you can guess. Their name is "Operation Blessing." Guess Who they take their marching orders from? So a team from Aurora, got sent from Louisiana, to organize at LifeBridge, who were trained by Operation Blessing, to go with a representative from The River, to serve with compassion in Lyons - all because the Church has One Head. His Name is Jesus! As you listen to Jesus, here's what you can do. Do you know someone (including yourself!) who really needs help? 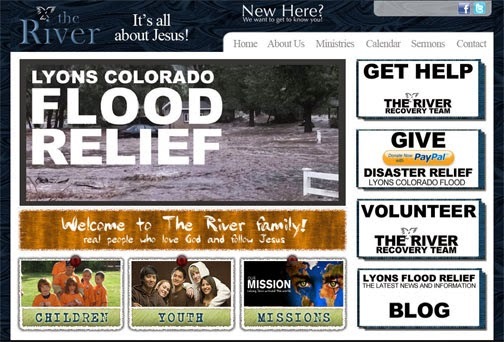 Go to this link: www.therivercolorado.org and click on the Get Help button. You will find a place to register their information. Jesus will send help. Are you willing to be sent? Not everyone is able to shovel muck. Some can make sandwiches. Some can sit and listen in a compassionate way. If you are willing to help, go to that same website and click on the volunteer button. You will be called to serve when Jesus needs your gifts and abilities. "Make the most of every opportunity in these evil days. Don't act thoughtlessly, but understand what the Lord wants you to do."